"This is a great dessert for a fancy party or a girl's night in! 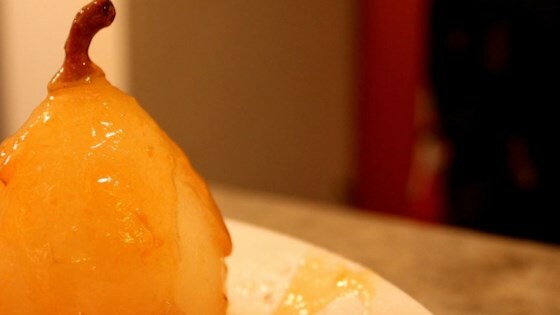 I love pears, and I love this recipe, because lighting the rum on fire caramelizes the sugar, and pulls out the flavor of the pears. I served this dish to a rich couple and got a hefty tip back, so I figured it must have been good!" REALLY IMPRESSIVE! Use a fancy baking dish and turn down the lights when you set this to flame. After the alcohol burns off, serve hot over ice cream. Very comforting. I will make this again! The pears tasted incredible and I want some more... Curse my family for eating it all! This recipe was very good. I added extra rum, only because I really like rum. This recipe is definitely a keeper. This was a lot of fun. Easy and fast to make. The sauce was really good. We saved the extra and used it on toast the next morning.